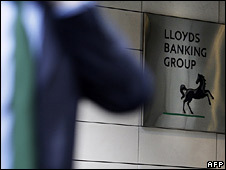 The government is to take a majority stake in the recently-created Lloyds Banking Group, the BBC has learned. Under an agreement with the Treasury, the government's stake will increase from 43% to between 60% and 65%. Some £260bn of toxic loans will be insured, and Lloyds will be required to lend more to households and companies. The deal was agreed on Friday night, but there are some legal formalities to be concluded. It is understood it will be formally announced on Saturday. Reports said Lloyds had been unhappy to give the government a majority stake. Hugh Pym, BBC chief economics correspondent, said the government's voting stake could rise as high as 65% - although with other types of share taken into account, its interest will, in effect, be 75%. Our correspondent added that the deal would be "very awkward" for the Lloyds chief executive Eric Daniels and chairman Victor Blank. They have come increasingly under fire from shareholders for their decision to buy rival HBOS. It was the January takeover of HBOS - a move that was supported by the government - that has caused the problems at Lloyds. Lloyds was forced to announced last week that HBOS made a pre-tax loss of £10.8bn in 2008, which it has had to absorb. By contrast, Lloyds, or Lloyds TSB as it was then known, made a profit of £807m last year, albeit an 80% fall on 2007. George Osborne, the shadow chancellor, said the government's latest move was proof that the first bailout had failed, and the test of it would be whether credit began flowing into the economy again. "It is also clear that the takeover of HBOS, which the prime minister helped orchestrate, is responsible for dragging Lloyds into majority public ownership," Mr Osborne added. The £260bn insurance deal is part of the Treasury's taxpayer-backed Asset Protection Scheme to insure banks' riskiest assets against further losses. It was put forward by Chancellor Alistair Darling in a bid to restore confidence in the banking sector. Royal Bank of Scotland was the first bank to sign up, announcing last month that it would ask the government to insure £325bn worth of so-called toxic assets, which are difficult to value and currently cannot be sold. BBC political correspondent Carole Walker said there were now many people in Westminster who believed that full nationalisation of the banks would restore confidence in the sector more quickly than the Asset Protection Scheme. "[They think] it would be simpler and easier for the government to nationalise the banks, and that in the long-term it would save the taxpayer a lot of money," she said. Some have pointed out that the government has put more money into RBS than its total share value, she added.